Beginning with a great conference on Fu Manchu and “the Yellow Peril”, courtesy of Translating China, I was introduced to just how far reaching the influence of Sax Rohmer’s 1913 fictional arch villain Fu Manchu, had become. The fear-entrenched racial stereotype, raised to hyperbolic state, not only shaped the occidental villains of the popular culture, but the wider Western perception of the Chinese. Whilst it was an interesting mix of speakers, it seemed very much like the ranks of academic white males, suffering indignation on the part of the Chinese race as a whole. One of the speakers, who had the good grace to be at least half Chinese, was actor Daniel York, in his capacity as the director of The Fu Manchu Complex. Set in the Edwardian era, the central characters of the piece are Fu’s adversaries from Rohmer’s novels, depicted as caricatures of the Holmes & Watson model. Dennis Nayland Smith, a police commissioner lacking Holmes’ intellect but as dogged in his determination as he is rampant in his anti-Asian sentiments, is assisted by sidekick Dr Petrie, a bumbling fool who hangs on Nayland Smith’s every word. The pair investigate a series of disappearances of high ranking colonial bureaucrats across Europe, all clues lead to a brothel in Limehouse, where they encounter Fu Manchu’s daughter and finally the evil mastermind himself, who reveals his secret weapon – a magical fungus which causes its victims to turn into jabbering cardboard cut-out coolies, with the Chinese waiter accent and the insatiable desire for noodles and money; the type of Chinaman who only lives in the imagination of the imperialist xenophobe. Whilst being thoroughly aware of political problems, as a writer and speaker on Chinese culture, I have always concentrated on the positives of cultural exchange, I felt wary of seeing a play that seemed to focus on the negative side of the Anglo-Chinese relationship. Very quickly, my worries disappeared. I found myself laughing out loud at the excessive, ridiculous but terribly inventive name-calling at the end of every sentence that Nayland Smith utters, calling the Butler, O’Reilly, a “green munchkin” and “clover face” whilst the Scottish housekeeper becomes a “Haggistani”. The humour is very much in the vein of Round the Horne, (which itself featured a Fu Manchu parody, in Kenneth Williams’ Dr Chu En Ginsberg). And scenes such as the assassin playing charades with Petrie and the reveals of comedy number plates, keep the tone light and raucous. Casting two oriental actors as Nayland Smith and Petrie, is both clever and safe from a casting point of view, also adding a layer of comic irony to the script. I was most impressed with the casting of Chippo Chung, as Fu Manchu. Casting a mixed Chinese/African actress as the height of Chinese Villainy confronts not only European views on race and power, but China’s own endemic race and gender prejudices. Jennifer Lim’s portrayal of Fu Manchu’s daughter, was also wonderfully rounded, challenging the Chauvinist binary view of East Asian women as either delicate lotus blossoms, or, the predatory dragon ladies. A more subtle point the play makes, is how inept the West seems to be at learning about the East. When Fah Lo Suee seduces Petrie and he is about to consummate his passion, he is confounded by the pronunciation of her name (flower dew water), and it nearly spoils the moment. Fu Manchu himself points out that rather than fighting uncouth battles, the Chinese prefer the art of receiving, absorption and assimilation. Around the same time I was watching this fantastic production, staged at the far end of the Victoria line, I was told of another play at the National Theatre Shed. Set between the 1990s and the present, the World of Extreme Happiness is the story of Sunny, a neglected and maltreated rural girl, who makes her way from countryside chattel to a cog in the giant Chinese manufacturing machine. Alongside her desperate attempt to rise in the world, we meet a well-meaning entrepreneur and his utilitarian publicist wife, Sonny’s whimsical but self-centered brother, her misogynistic father whose only love in his life is ironically his birds (not a subtle pun at all), and auntie Wang Hua, the village midwife. I loved the kitch, pop art style poster, and from the synopsis I’d read, I was really excited to finally see a play about contemporary China, the modern condition, rather than regurgitated anti Chinese western fears. I was therefore, exceptionally disappointed. Where the set-up had great scope to examine China’s emerging middle class, the burden of social pressures, the increasing westernization and loss of culture, the American born playwright, Francis Ya-Chu Cowhig, was able to offer no insight into modern Chinese living, other than the composited bad news stories focused on by the Western media. Whilst the play could have quite competently focused on any one of the many issues it touched on, the plight of female babies in China, the trials and tribulations of migrant workers, or post-cultural revolution generations dealing with the trauma of their forebears. Instead it flits from one issue to the next, presenting a series of one-dimensional characters along the way. 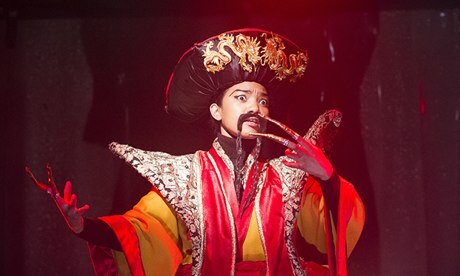 As Strong-willed as Sunny, played by Hogwarts Alumni Katie Leung, is set up to be, she does nothing but fulfill the goals of others, and the play is left with no direction, other than to portray a series of grotesque vignettes for the middleclass, overwhelmingly European audience to tut at, whilst congratulating themselves for not having, as a culture, to resort to that level of segregation or exploitation for… oh… at least sixty years or so. Yes there have been many cases of appalling factory conditions, over-ambition, and ultimately, China has found these untenable, and since the mid 2000s, labour laws have increasingly improved, not that this sort of actual evolution is of any interest to the writer. I pause now, and take a breath. Whilst a theatre reviewer may be able to take a calmer look at this piece, I am a cultural commentator, and have to examine the production, not only as a piece of art, and there are some fantastically choreographed elements, clever uses of lighting, and interesting stage design, But how these projects present the culture I was born into, to the culture that I live in. The supporting characters are no subtler, and seem to only be present as Cowhig was unable to pour the evils of China all on poor Sunny’s head. Her self-improvement obsessed friend Ming-Ming could be lifted straight out of a day-time Hong Kong soap opera, as could her melodramatic suicide. Wang Hua’s fake Chinese accent is as clichéd as her pantomime emotions. The brother, with his analogies of the Monkey King as a symbol of freedom, is rather hackneyed, and Artemis Chan’s back story seems to have been thrown in to show that things were just as awful in China’s past as they are now. York’s script ridicules Western fear of the Chinese, started and fuelled through decades by a completely unrealistic racial stereotype from an Edwardian pulp fiction writer who knew nothing about the real China, stereotypes from Cowhig’s play, set about 100 years later, the victimized country girl, the ruthless high flyer, misogynistic country folk, desperate chasers of fame and power, seem to take over from Fu Manchu, feeding contemporary Western fears of the rise of China, as a ruthless and inhumane nation taking over the world’s wealth by keeping all its people in chains. The kind 21st century Sinophobia that the Fu Manchu Complex alludes to, the genetically modified soldiers coming to take over Britain, steal its jobs and gold medals, to demonstrate that the problem still exists in the present, is being reinforced by plays such as the World of Extreme Happiness. As a theatrical production, I was impressed with how well both works used such minimal, representative and mobile stage sets, with creative lighting and music, leaving most of the scene setting to the characters themselves. These subtle visual queues created vivid atmosphere, allowing just enough for the imagination to fill in.